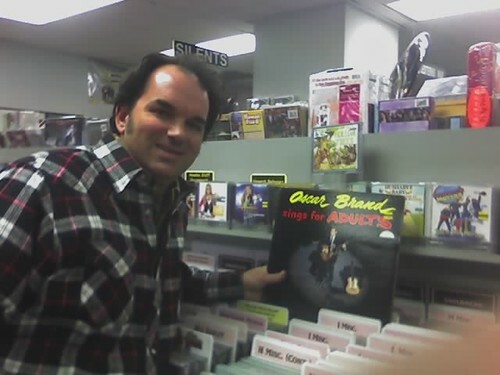 Me with my Oscar Brand lp and The Hollow Trees CD at Amoeba, originally uploaded by gvaine. So I was at Amoba the other night, and I found The Hollow Tree's CD for sale there. This is the version put out by Water Music Records. It has a little bit different cover art and they re-ordered the songs. It was the first time I'd ever seen it in a store, which was a pretty nice feeling. I was carrying an Oscar Brand LP called "Oscar Brand sings for Adults," and I thought it would be a good idea to pose for a picture with it. Oscar Brand is a folk singer from New York who has recorded over 90 albums and has hosted a radio show called Folksong Festival every Satruday for 60 years! His LPs are easy to find, and I have quite a few of them. He has a series of "Bawdy" records from the 60's which have great cover art and are pretty funny. I also have a couple of his records for children, and as a children's performer, I couldn't resist this record. 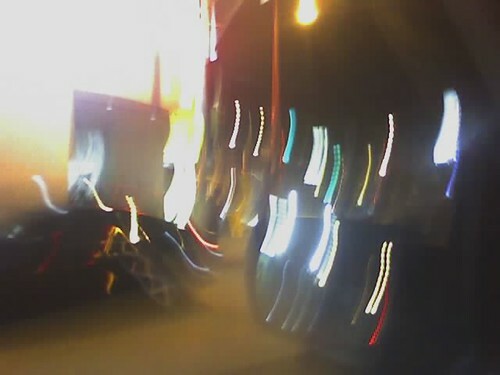 Frank Fairfield Busking in front of Amoeba on a windy night, originally uploaded by gvaine. You can sort of see him standing there with his fiddle by the pole on the corner in front of Amoeba, busking. I recognized him from a couple times when he showed up at some old-timey jams I frequent. He is a unique performer who gets very focused when he sings and let's the tempo and beat counts vary depending on the mood he's going for. He sang a great version of "Hesitating Blues" for me and my buddy and some other folks in the cold wind. We then paid our respects and took off into the night, while he stayed there playing. When we were driving away, I took this picture with my cell phone. Are you familiar with Jed's art? I went to school with Jed, and he is one of the most talented artists I've ever come in contact with. We checked out the first episode of Make: Television this weekend and it's a winner. It's a celebration of creativity and homespun ingenuity on all scales. It's reassuring for me to see, even on a small scale, some cultural focus shifting to the humble makers out there. The show on public television everywhere - check your local listings. I recently mentioned the Santa Clarita Cowboy Festival, and I wanted to talk a little more about it. The Cowboy Festival first and foremost a cowboy entertainment festival, featuring many stages and top cowboy themed talent from around the country. Cowboy singers and poets each play several sets on stages ranging from small intimate rooms to large tented areas. The talent is top notch, including America's Greatest Cowboy Singer Don Edwards, gypsy western swing from Hot Club of Cowtown, "America's most successful poet" Baxter Black, magician Pop Hadyn, Saloon Piano from Dave Bourne, and much more. There is also a large food area, featuring authentic chuck wagon food (beans) as well as normal fair-type food stands. Alcohol is served as well. There is a marketplace for Western themed clothes and knick knacks too, and a smallish kids area where kids can try their hands at making a lassoo or roping a steer. One of my favourite attractions is the blacksmith pictured above. We've had horeshoes made for the last three years there ("Sean" "Grant" and "Truck.") He's a colorful character and puts on a show of his own. Plus you can talk to him about the community of cowboy re-enactors who travel around the country to festivals like this one. It's a vibrant subculture - who knew? The Festival is held every year at Melody Ranch Movie Studio in Santa Clarita. This is a large working movie western ranch, Built in 1915 and owned for many years by Gene Autry. The HBO series Deadwood was shot there. It's got a great history and there is a museum there worth checking out. So mark your calendars for April 25th and 26th for the 15th annual Santa Clarita Cowboy Festival. I'd like to tell you about a great local magician named Pop Haydn. Pop is a master of close-up magic, as well as a recognized authority on street scams such as three card monty and the shell game. He is also the vice president of the Magic Castle in Hollywood. Additionally, he is a snake oil salesman, raconteur, and classical actor. In his act he uses his 19th century persona to combine great comedy and incredible magic. Though his tricks are classics such as the cut and restored rope and the linking rings, he performs them with such mastery that they are a pleasure no matter how many times you have seen them. Pop's website is quite something as well, full of the same blustery humor that you can find in his act. I highly recommend starting with his biography. Check him out in this youtube video, and then see more videos on this page.